The Club Championship standings will be calculated from each clubs overall winning percentage points from all their registered teams from the preliminary rounds, with the calculation commencing after any initial regrading. Should no regrade occur, the Club Championship standings will start from round 1. The Club with the highest percentage at the completion of the preliminary rounds will be declared Club Champions. To be eligible for participation in the StGBA Club Championship, a Club must have three (3) or more Teams. 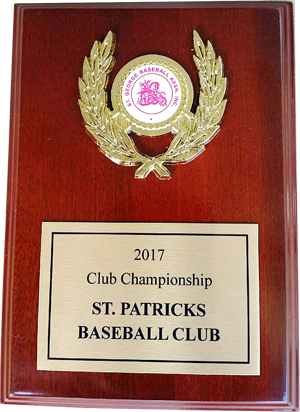 The St Pats Baseball Club first achieved this momentous and prestigious award in 2017 with teams registered in 2nd, 4th and 7th grades.